Right now there is a full queue of draft recipe posts waiting for me every time I log in to Natural Comfort Kitchen, not to mention the ones floating around in my brain. Yet here we are on the seventh day of May, and I have yet to post anything this month. If you’re still with me, thank you. I’m not quitting blogging, or even really planning on cutting back–just figuring out ways to fit it into the busier seasons of life. Just like every other blogger or individual with a hobby, right? My issue, and maybe you can relate, is perfectionism. If I can’t do something 100%, my preference is to do it 0%. If I don’t have perfect lighting, two and a half hours for photography, three hours for photo editing, etc., I busy myself unloading the dishwasher or doing legitimately important, but entirely unrelated to the blog, items from “the list”. I forget that some people, even if they are friends of my mom (okay, and maybe a couple strangers), still tried and loved my recipes when my photography was far less visually pleasing than it is now. But, I’ve started reminding myself of those readers and recipe-tryers, and have been mulling over how to maintain my online home while offline life ramps up. Who knows what the future will bring, but I’ve come to understand that there is not a single definition of a successful food blog. 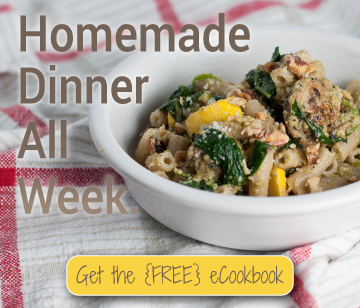 For now, I think it’s better to post a recipe that really worked for a normal weeknight dinner, even if I have one sub-par photo of it, than a recipe that doesn’t excite me, even if I have 10 Pinterest friendly, “perfect” (no such thing) photos of it. Thanks to some unfortunate events this weekend, I have acquired an iPhone 6, so even my sub-par camera phone pictures should be a little more fun to look at. My dad just departed after a long weekend here to eat more vegetarian food than his system can handle, roam NYC on foot and two wheels, and ride the 5 borough bike tour with Steve. Just one example of offline events that don’t even make me think twice (or once, for that matter) about missing a couple blog posts. I’ll spare you the full, mundane story, but the end of my bike tour volunteer shift found me wandering an unfamiliar corner of Manhattan trading an Americano purchase for a phone charge at some random coffee shop on Lafayette and Grand which, by the way, made a damn good coffee, if you like it smooth and strong. I played the weird hippie girl sitting in one of the two seats in the store wearing my TOMS, reading Autobiography of a Yogi, and munching on a bag of raw granola. My patience and courage were rewarded, though, because after reuniting with my brother-in-law, we made quick work of obtaining some bagel sandwiches from the Russ & Daughters. If doting over the construction of a bagel sandwich for 5 minutes can be described as quick work. No wonder that line is so long. After that incident, I think it was safe to say my phone would be retiring imminently. Steve’s followed not soon after. Trying to enter brother-in-law Kian’s apartment, Steve, logically, called me–the person who does not live there. It’s hard not to giggle (sorry honey) as I picture him outside juggling his phone and a bike on the nonexistent front step as he calls Kian back to get buzzed in, sending his iPhone to its screen-shattering death. It’s all for the better, though, because the pictures of this super-easy Southwest quinoa salad aren’t plagued by distracting distortion, a la iPhone 5. Pretty sure the iPhone 7 is going to eclipse the capabilities of my/Steve’s aging D90. 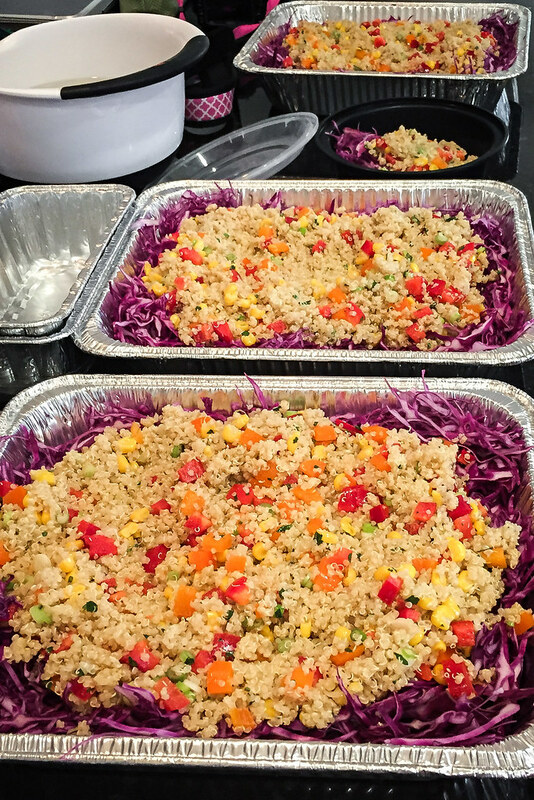 Yesterday I delivered 25 servings of this quinoa salad, along with black beans, organic chicken, a quart of lime vinaigrette, crumbled queso, chips, and a massive pile of guac, to a client’s daycare provider. She wanted to serve the teachers something healthy but delicious, since they work hard caring for babies and little ones but aren’t necessarily rewarded with the pay to afford healthy, organic, homemade meals all the time. I delivered copies of the recipe with the food, hoping to show the audience how easy it is to reproduce this budget-friendly salad. 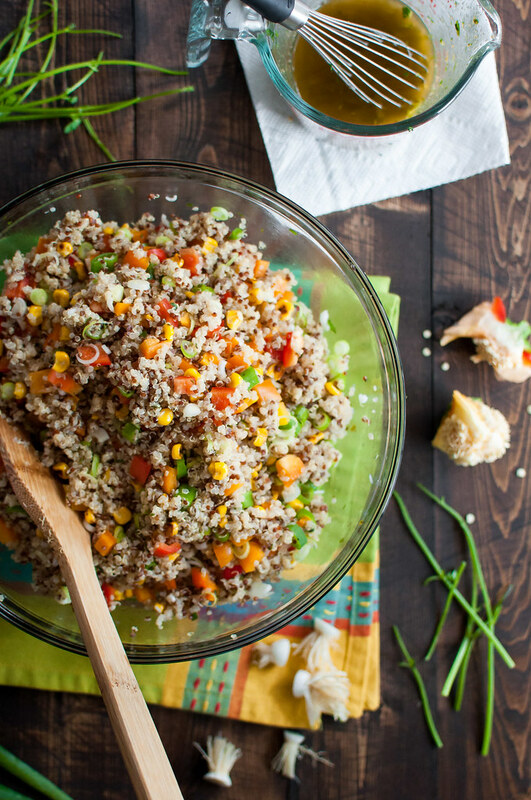 Quinoa is, above all, satisfying as it sits in your belly, but it’s also gluten-free and vegan, as is this entire recipe. 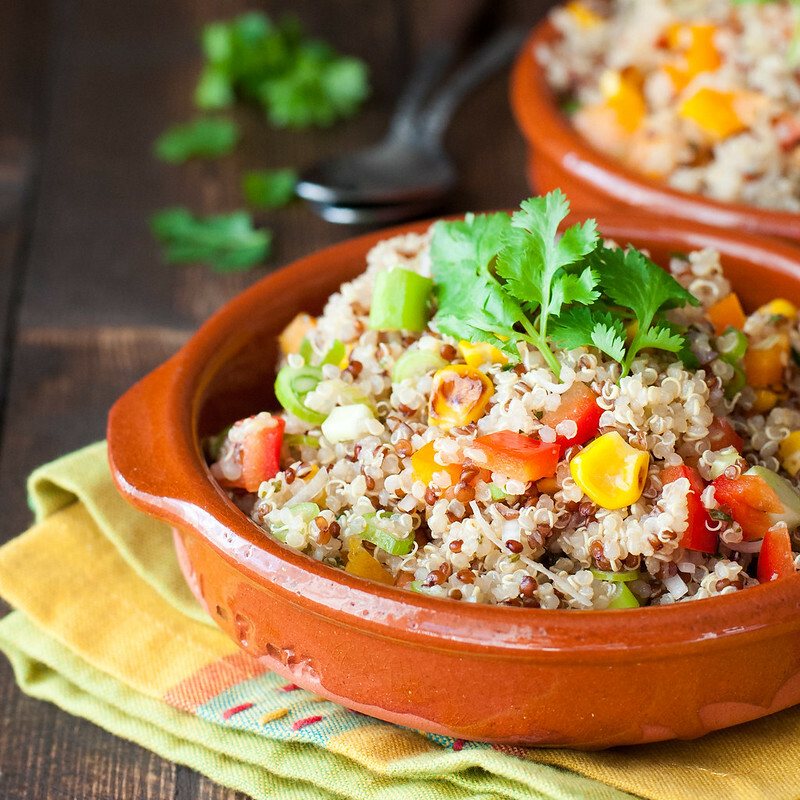 The salad calls for the addition of only a few more raw ingredients, so there’s no cooking except for the quinoa. Along the same lines, the lime vinaigrette includes several raw spices that you probably already have in your pantry. 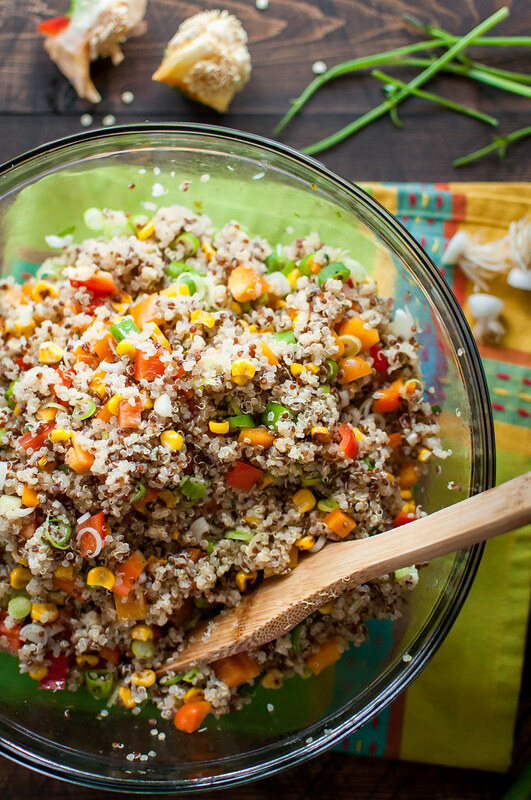 Despite its ease and convenience, the quinoa salad has a rainbow of colors and contrasting textures to keep your eyes and mouth happy. The best part, in my opinion, is that it’s one of those salads you can make and keep in the fridge for probably 4 or 5 days without much detriment to quality. It’s just as good cold or at room temperature, so you can tote it around with you for a few hours while traveling or doing whatever might be on the agenda for the day–work, errands, kids’ soccer games, air travel, etc. Then, when you’re about to pass the hangry point of no return, just whip this flavorful salad out of your purse, backpack, glove compartment, or man bag and you’ll be back on track in no time. A healthy, colorful salad to serve anytime, anywhere. Lime vinaigrette with raw spices and fresh cilantro adds surprising punch and extra green to only a few other ingredients. Bring 1 cup plus 3 tablespoons water to a boil in a 1 quart saucepan. Add rinsed quinoa, stir, and return to a boil for a minute. Then cover and reduce heat to low, simmering for 15 minutes without stirring. 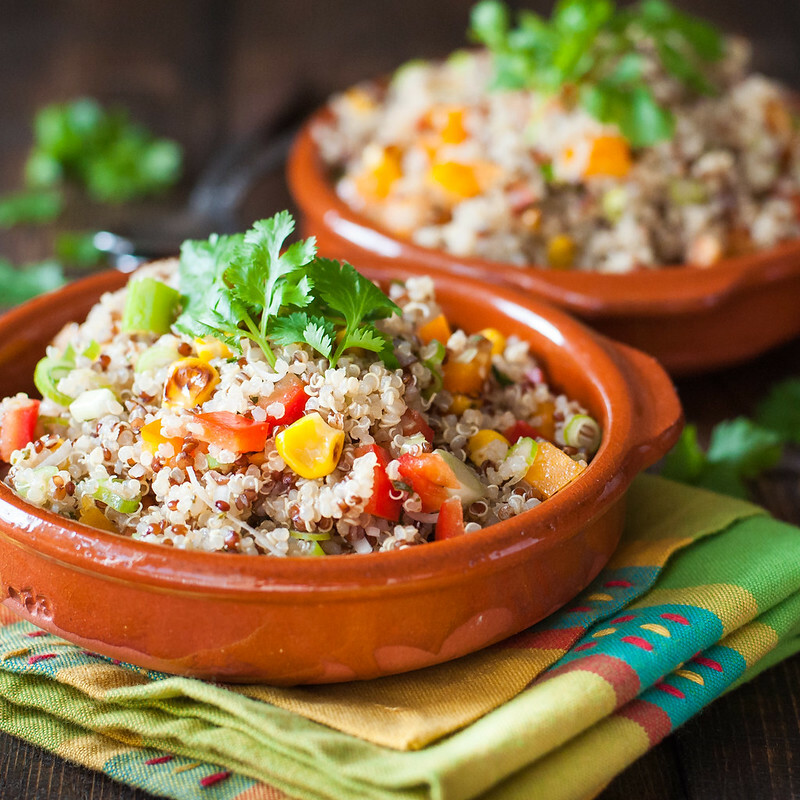 If the quinoa has absorbed the water and tastes done (tender, no crunch, but not falling apart), drain in a colander then place in a mixing bowl to cool. Meanwhile, make the dressing. Whisk or stir together all the ingredients and set aside, or refrigerate if making ahead of time. Add half the vinaigrette to the quinoa and stir to combine. Stir bell pepper, scallions, and corn into the salad. Add remaining dressing a little at a time to the quinoa (to ensure the quinoa doesn't get soggy) or serve it on the side. 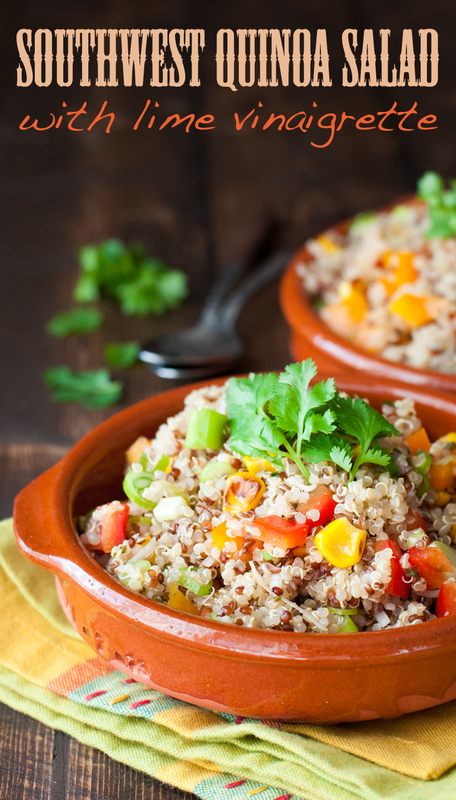 Taste the dressed quinoa salad and season with salt or more hot sauce to taste. Serve salad alone or with any of the options listed above. Keeps well in the fridge for a few days and can be served cold or room temperature. Salad is gluten free and vegan. Always check packaged ingredients (spices, etc.) for allergens. To rinse quinoa, run cold water over it in a fine mesh strainer for about 30 seconds. Note: This page contains affiliate links. It does NOT contain sponsored content. 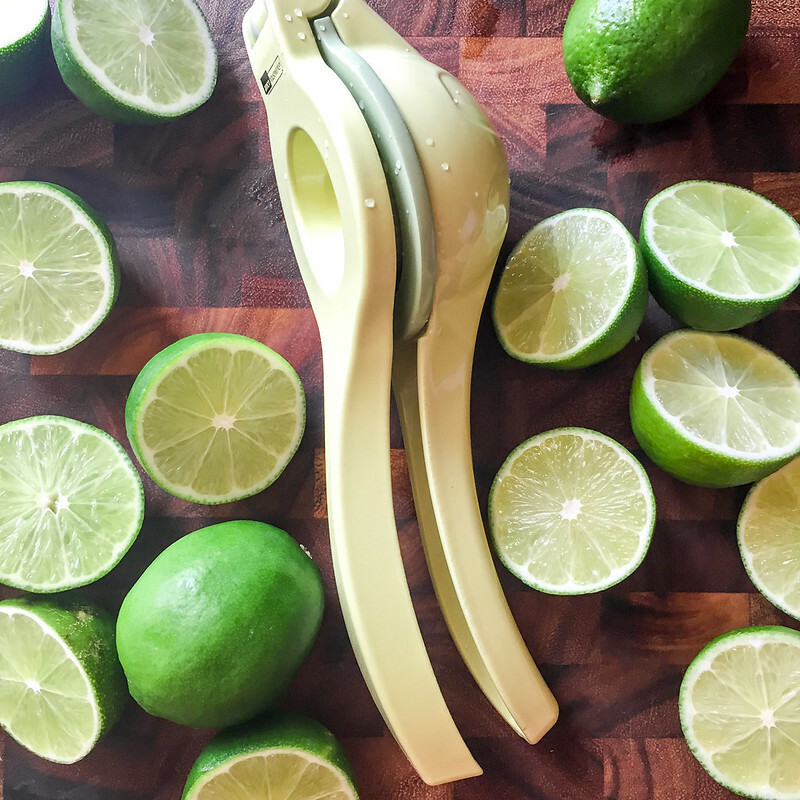 Affiliate links (to products I recommend, on Amazon) offset my ingredient and website maintenance costs, so I can keep bringing you zesty recipes like this one. Thanks! I love power salads like this. They are super nourishing and make for the most delicious of dinners. I have to make this recipe.. thanks for sharing it. Thanks for checking it out Thalia! Salads are pretty much my life right now given the heat wave we’re experiencing where I live.